Diabetes is associated with the absorption of carbohydrates. Carbohydrates are considered to be an integral part of dog food, as it provides energy to their body. Once carbohydrates fail to be absorbed into the body, they start to circulate in the blood. Insulin is the pancreatic secretion which controls blood sugar levels. In such cases, either insulin is not properly secreted to control blood sugar levels or cells become insulin resistant. Diabetic dog diet recommendations will vary based on if a dog is overweight or hyperglycemic (high glucose levels in the blood). Carbohydrates: Diabetic dog diets should only contain controlled amounts of carbohydrates. Carbohydrates exist in three different forms; simpler to complex (dietary fiber, simple sugars, complex carbohydrates). The more complex the carbohydrate, the more difficult to digest and the greater the impact on sugar levels, such as potatoes and whole grains. Dog foods contain more complicated forms of carbohydrates, therefore they have a greater effect on sugar levels. Even then, the amount of carbohydrates should be controlled. There is evidence that less insulin is needed when there are lower amounts of carbs in the dog diabetic diet. Not all carbohydrates have an equal effect on glucose levels. For example, rice should be avoided in diets for diabetic dogs with preference for wheat, corn, sorghum and barley (often seen in combination). Since the same amount of insulin is used each day, the amount of carbohydrates should also be the same. Fiber: New studies show that diabetic dogs do not require increased amounts of fiber, but should have the same amount as healthy dogs. That said, some specific dogs will respond, although it is not known why some do and some don't. Fat: Diabetes in many cases is due to pancreatitis. Pancreatitis is an infection of the pancreas, which occurs when the pancreas fails to secrete insulin. Dogs with pancreatitis usually are recommended to have diets with low or no fat. Confirmatory diagnosis of diabetes can only reveal such a condition and such dogs should not be fed with diets containing fats. Since pancreatitis is difficult to diagnose, some veterinarians believe a low fat diet should be used for all dogs with diabetes. Pet nutritionists are concerned that dog diets which contain low or no fat and reduced levels of carbohydrates may not help to improve or maintain the physiological condition of older dogs. Therefore, it is recommended that blood sugar level, insulin and the body condition be closely monitored every 1 – 2 weeks of a dogs life. It is thought that dogs with a normal weight do not require fat restriction (unless suffering from pancreatitis) while fat should be restricted in overweight dogs. When feeding a moderate amount of fiber, it is believed that a blend of soluble and insoluble fiber, such as soy or sugar beet pulp is best. Protein: There is no call to reduce the consumption of protein unless a dog is also suffering from persistent proteinuria (excessive amount of protein in the urine). In terms of a dog diabetes high protein diet, this might happen as a result carbohydrates and fats being reduced. Be sure to feed high quality proteins such as chicken, fish, lamb, egg, and beef vs. lower quality plant proteins. Water: Diabetic dogs show signs of polydipsia or excessive thirst. Water should never be restricted for diabetic dogs. A diabetic dog should drink water often . The water level will not only help in reducing fluid deficiencies but it also reduces the chances of a potential medical emergency due to ketoacidosis (build up of acid in the blood). While treating diabetes mellitus in dogs, insulin therapy is the primary choice of therapy. Usually two injections of insulin per day are sufficient in dogs. It is recommended that two meals of equal calories should be fed to a diabetic dog at the time of injection. Two meals will not only help to control blood sugar levels, but will also help to reduce the weight of the diabetic dog. Water should never be restricted to diabetic dogs with no frequency or schedule recommendation for water intake. As an added level of support, there is a homeopathic remedy that combines ingredients associate with pancreas and liver support and with maintaining normal sugar levels in the blood. The product is GlucoEnsure which is a good source for additional research and natural and conventional support methods. When a dog has diabetes due to pregnancy, then a diet that is high in protein and lower in fat and carbohydrates is usually recommended. A diabetic dog diet for overweight dogs includes high fiber and high carbohydrate levels until the weight is brought into a normal range. Options include Purina OM and Hill's Prescription Diet w/d or r/d. If a dog has high blood sugar, than a commercial diet with the right combination of complex carbohydrates and fiber is usually recommended. 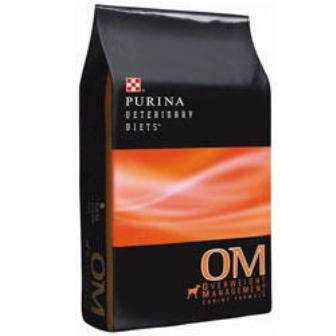 The Purina OM and Hill's r/d or w/d mentioned above also meet this criteria and are excellent choices. Also be sure to keep to your dog's insulin injection schedule. Feeding should occur 2 to 3x per day to avoid hyperglycemia, which can occur if only 1 meal i s provided. If a dog is underweight, then a lower fiber diet is usually recommended such as Iams Less Active Weight Control. If for some reason your dog receives too much insulin, he or she would suffer from a condition called canine hypoglycemia. Watch for symptoms such as changes in behavior (confusion, disorientation), and other signs such as staggering, shivers, collapse and seizure. The condition is caused by low blood sugar. If your dog is awake, provide a sugar source such as sugar water or corn syrup. If the dog is not conscious, try rubbing sugar on lips. Contact a veterinarian as soon as possible. A dog should recover in about 30 minutes after receiving sugar.